"Applex Management Ltd's main Corporate Value is based on the belief that our customers' needs are of the utmost importance. We are committed to meeting those needs, exceeding your expectations and earning your trust." Are your personnel, processes and plant keeping up with that vision? To stay competitive in today's tough business world, it's crucial to drive your business growth forward. All businesses need to reduce costs, develop skills and drive for improvement with courage, creativity and managed growth strategies. Applex Management have spent over 25 years studying, developing and deploying successful and proven management techniques in the fields of Lean Management, Kaizen, Strategy Deployment and Leadership Coaching all of which are designed to help you achieve your goals. “Every day a little bit higher” – Taiichi Ohno. 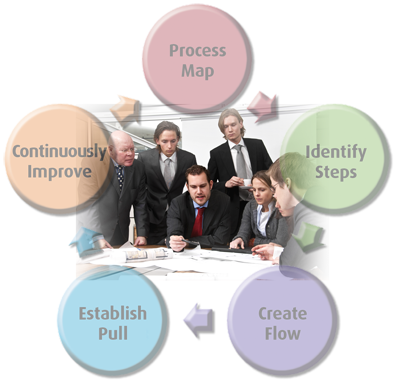 Applex Management is a Lean, Kaizen and Leadership Coaching Consultancy. With a leadership coaching programme tailored to the needs of your business, we will teach your leadership team no-cost methods and techniques to increase your profits by streamlining your processes, i.e. the daily jobs carried out by everyone in your organisation. We will teach your team the Kaizen Cycle of Continuous Improvement, so improvement activity can continue in your business indefinitely. This will give your organisation that crucial competitive edge. We coach senior staff to manage Kaizen effectively through developing their own coaching skills. This will generate employee and stakeholder engagement and we will show your leaders how to measure the business benefits of these improvements through at-a-glance visual management of your critical business measurables, such as Productivity, Quality, Cost and more. Learn more about Lean Principles and the kaizen cycle of Continuous Improvement. For Lean & Kaizen teaching and leadership coaching that will make a huge difference to your strategy deployment and execution, call Applex Management today.